The Samsung developers preview tablet, a model for developers was unveiled at Microsoft’s BUILD conference last week. It was the only existing Windows 8 tablet and all the models; they were only for the developers. Microsoft even gave away 5000 of those tablets to the developers in attendance as part of its effort to attract them so that they will help them accelerate the process for creation of applications for the platform. Regarding the tablet, Microsoft said that they provided it because the company believed that it would help the developers, as they can test the applications they have already created for touch screen. But surprisingly some of the developers who have apparently for whatever be the reason put these devices for sale on eBay. 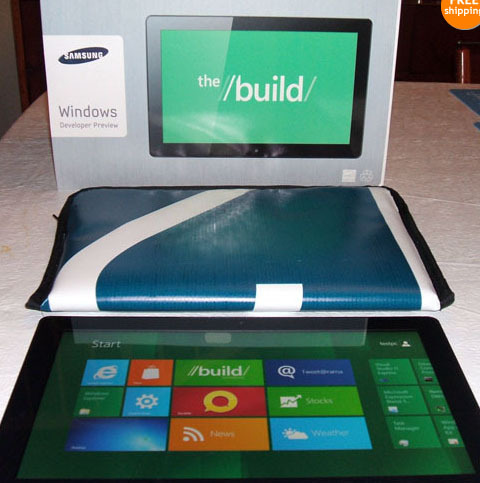 There are at least four auctions selling the tablet from BUILD, with top bids in the range of $2000 and above. Four of these tablets are already sold and the price is still going on. The first one was sold last Saturday for about $1800, but now the prices are increasing further. Two of the active auctions even offer a Buy it now price of $3500. Something we are really unsure about is as why are these devices for sale? Even more surprising is why these devices are attracting such a price? Though the question of why they are put on for sale is really a tough one, which only the sellers can answer. But for the second one we can really imagine the value of the product as it contains an unreleased version of Windows 8. The windows 8 is the next major version of Windows, it has borrowed some of its features from the Windows Phone operating system. The Metro-style interface that emphasizes touch-friendly tiles and full-screen applications is one of its major traits acquired from the successor. According to the specifications listed on the eBay this model is powered by a Second generation Intel core i5 processor. The display provided is a Samsung Super PLS 1366 x 768pixels. A 4GB DDR3 RAM is provided as an internal memory and for storage of 64GB SSD is added. For connectivity Wi-Fi and 3G both the options are provided. Sensors, USB, micro SD, HDMI are some of the other interfaces provided. The tab measures to be 11.6inches diagonally and weighs around 909gm.